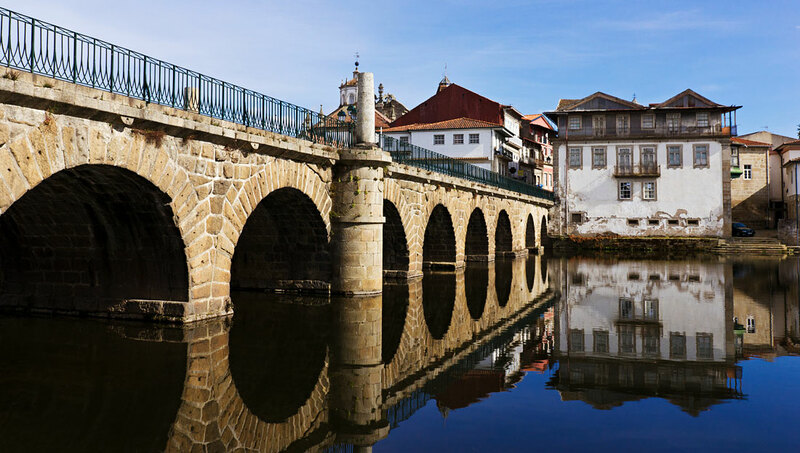 In the remote northern region of Trás-os-Montes, Chaves (meaning ‘keys’) is only 10km away from Spain and lies on the upper stretch of the river Tâmega. It is a spa town steeped in history, the most important example of which is the fantastically maintained Roman Bridge. This feat of engineering was completed at the end of the 1st century and all twelve arches are still visible. Reputedly built by locally sourced slaves, as one of the inscribed stones attests, it allowed people to cross the river all year round, thus joining the two existing parishes. Until its construction, communication between the two was limited to summer months of low water. Cars still use the bridge, albeit less than before since a new bridge was opened fairly recently, but do make a point of crossing on foot as it provides a lovely view of the riverside town. Originally a fortified settlement due to its frontier location, it has been captured and fought over by all manner of invader. The two forts - São Neutel and São Francisco - are situated on the outskirts of the town and are both in a decent state of repair, especially that of S. Neutel. The old houses in the medieval quarter are tall and thin allowing more accommodation to exist within the confines of the ancient walls. Many inevitably did not stand the test of time, but some of those remaining still sport their various balconies, each more pronounced than the one below, meaning that in some streets, like the Rua Direita, opposite top floors are very neighbourly indeed and the street below decidedly shaded. From the main square, the Praça de Camões, we see the 14th century keep built by Dom Dinis, now containing a military museum which contains displays focusing on Portugal’s involvement in WW1 and its 20th century colonial struggles. Two of the town’s churches also flank this square, though as this region has always been the poorest in Portugal they are simpler and plainer that their counterparts in other parts of the country. The most beautiful is the Miseracórdia with its ornate columns and biblical tales told on typical 18th century tiled friezes. Although nowadays known for its traditionally cured presunto hams, it was the existence of gold nearby and the natural hot springs which originally made this town desirable. The water which issues from the ground is one of the hottest in Europe, with a temperature of over 70ºC, and still draws people from near and far to take its thermal waters in the hope of easing various ailments. Other spas exist in the vicinity, including one at Vidago a dozen kilometres south west. This small town also boasts one of the few examples of industry in the area with its mineral water bottling plants. Such lack of industry means that even today this is an area of considerable economic emigration, particularly to France. August sees the return of many of it migrant families and the population is said to double as a result. Nearby places of interest include an enormous rock of Outeiro Machado, near the village of Soutelo. The multiple engravings on this 50m hunk of stone are said to date back to at least the Celts. Another rock of note is the Bolideira near the village of Monforte which is said to be balanced on top of another piece of granite and can be rocked despite weighing several tons. Perhaps the most interesting local curiosity is the nationally acclaimed Wine of the Dead produced in the village of Boticas since the invasion of the French army in 1809. Legend tells us that the local people buried their wine to avoid it being pillaged, and upon digging it up, once safe from the enemy, discovered that it in fact tasted better.